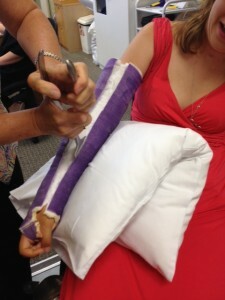 Emily saw the surgeon for a review post deltoid to tricep tendon transfer surgery, the plaster cast was removed and this more vibrant purple one applied. Day two post surgery. 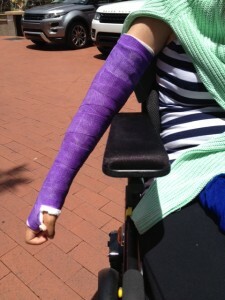 Apart from the enormous cast on Emily’s arm, she was feeling tired. Hospital are not renowned for good food or being peaceful places of rest. The food may be edible but it is never exactly what you fancy. Rest is disrupted by the multitude of professionals; doctors, nurses, cleaners, the trolley lady and the physios, probably visiting others in the ward, but their conversations all audible. It is worse at night. Noises are amplified, patients are disoriented and call for assistance, sleep is at best disturbed. Emily’s first day post tendon transfer. I had anticipated her being drowsy after an anesthetic and surrounded by Dr’s, on ward rounds, and nurses, with rattling trolleys, all trying to assess her pain, progress and care needs. Visiting hours are posted as 11am to 8pm so with all of this in mind I booked myself a hair cut. Emily will return home in a day and I will have no time for a salon appointment. I walked into the hairdressers feeling like a Yeti, I made an effort to relax, I closed my eyes during the head massage, enjoyed an extra hot coffee and unexpectedly met and chatted to my friend who had come to the parlor to book a date and time for her hair. All my good humor evaporated as I hunted for a space at RNSH multi storey car park , I was lucky I found a spot. Memories flooded back to me, I remember the devilishly difficult parking situation from being here last year as Emily recovered on Level 7. How could I have so quickly forgotten that detail, it seemed such an integral part of our visiting routine, getting to RNSH early to ensure a long stay bay. Surprising how promptly I’d left hospital memories behind. The day of Emily’s surgery. What do you do while you wait? The day of Emily’s surgery. To be a nerve, or to be a tendon – that is the question? I didn’t realise I was so nervous until I looked at my worried thumb nail. Emily and I drove silently to Lidcombe, this morning, to attend her physiotherapy session. Both of us wrapped up in quiet contemplation. Nothing needed to be said, it’s perfectly obvious that we’re both in an emotional holding pattern, circling thoughts, held in a queue, waiting for her time slot to be confirmed for surgery tomorrow. 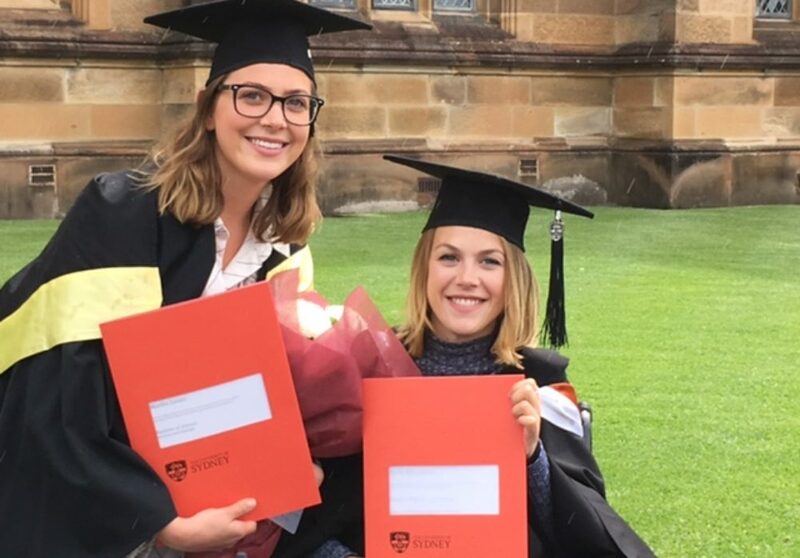 This process started early last year in Royal Ryde Rehabilitation as Emily was referred to the tetriplegic hand clinic at Royal North Shore Hospital for assessment and monitoring. Walking into clinic 5, waiting to be seen by the specialist is daunting and exciting all mashed into a butterfly stomach. The surgeon didn’t look up as we entered the consulting room; the walls were lined with therapists, students and trainees. I settled into the chair I was offered, Emily had her own chair. Our saucer eyes scanned the room for any familiar faces. The surgeon asked questions and came to sit on the front corner of her desk. Any questions we uttered seemed naive so we listen. Today we went to Royal North Shore Hospital for a pre operative appointment in preparation for surgery on 19th November. The department aims to have all the consent forms, information, bloods taken etc in readiness for the day of admission. Alarmingly we were met at the reception desk by a staff member with the name badge – Death!